At R.P.M. 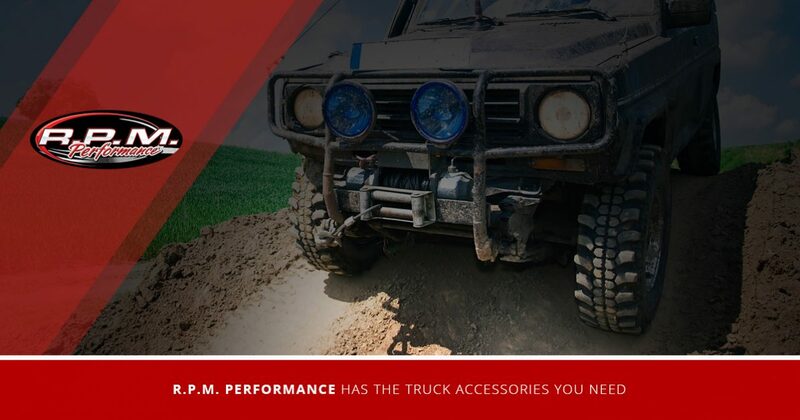 Performance in Burlington, we carry a large number of the most useful and in-demand truck accessories. These accessories are a great way to make your truck look cooler while also creating a vehicle that is unique and designed to perfectly meet all of your needs. Whether you drive your truck for work or for fun, we have a ton of choices for you. Contact us today to find out what we have available and how we can make your truck more fun to drive. In addition to all of the parts and accessories at R.P.M. Performance, we are an authorized Line-X installer and dealer. Our bed liners form a perfect bond to your truck, ensuring the best fit, and the best protection. These liners stop scratches, dents, rust, and staining, while also providing you with sound and vibration dampening qualities. No other bed liner even comes close, so call us now! If you like to off-road, suspension upgrades are an excellent way to have more fun. We sell and install the best lift kits available to give your truck the clearance it needs in order to crawl over the largest rocks and biggest dips. We have leveling kits, too. R.P.M. Performance in Burlington also carries many different springs and shocks to make your ride smoother, more comfortable, and safer. Tires and rims are a vital part of any truck, SUV, or car, and R.P.M. Performance has all of the hottest wheels and tires for almost any vehicle. Whether you need a reliable set of all-seasons for your passenger car or a set of aggressive snow or mud tires, we have a lot of options. Do you not like the way your stock truck wheels look? Come by our shop today to see the latest choices. Thanks to the latest metallurgic technology, truck wheels don’t have to be bland and uninspired. New designs can by just as dynamic and interesting as wheels you see on souped up cars and they are available in a wide variety of colors. All of these new options are available without sacrificing reliability or strength. Our shop is also set up to provide you with custom paint, hydrographics, window tinting, and tons of other truck accessories and services that can turn your vehicle from boring to inspiring. When you need a new trailer hitch or a set of nerf bars, call R.P.M. Performance in Burlington now. Our technicians can install everything we sell quickly and correctly. There is no better supplier of truck accessories in the area that has the prices, the selection, or the customer service that we offer, so give us a call now. We offer free estimates on everything that we stock, so there is no harm in finding out just what it would take to turn your truck into a fully custom vehicle that you will love driving and that you will love being seen in.